Here Comes the New Technology Popup Generator and Hover Ads Creator Software That Can Make Your Sales Go Boom! Popup Toolkit v2.16 is now available! Google Chrome, Opera, Edge Browser, Internet Explorer, Safari, Firefox, Netscape, Mozilla! Have you felt the need to advertise your products and at the same time make the advertisement a pleasant experience for your visitors? Have you thought of a really enjoyable way of expressing your offers to the users and thus increase multiple times your sales, your subscribers, your commissions and your PROFITS? Have you ever asked yourself "Is there a way to present my products and services in a likable way from the user's point of view?" There is a solution that might change your advertising experience from upside down and could make your visitor love your offers! A solution that may multiply your web profits as no other technology nor approach could ever do. New updates are released regularly with new features and bug fixes - FREE of charge to all customers. Note: All examples are packed inside the software as templates! Popup Toolkit generates FULLY unblockable on-exit DHTML popups. The new Intelligent Heuristic Algorithm will Open the Unblockable DHTML Popup JUST when the visitor is trying to leave your website. See a FULLY unblockable on-exit DHTML popup by moving your mouse upwards against the address bar of your browser. Popup Toolkit generates FULLY unblockable on-exit text-only popups (note: Firefox blocks the text in the fully unblockable on-exit text-only popup). Popup Toolkit Software generates Standard old-style Popups. Normal Sliding, Fading Sliding, Accelerated Sliding, Bouncing Sliding, Dizzy Sliding. Exploding and Imploding Popups, Unfolding and folding popups - vertically and horizontally. Spinning Exploding Popup Effect. Incredibly Powerful Jumping Effects Engine. Jump fast or slow, to the wall or to the ceiling. Caterpillar Popups are enjoyable and attractive. Rolling Popups use the Latest Web Technologies to please the Visitor and acquire their attention. Popup Toolkit generates Sticky Notes Popups with all effects. Note: There is a tutorial on how to make Sticky Notes using Popup Toolkit here. The Popup Content Management Capabilities are extensive and rich of features. NEW: Plugin for WordPress . Allows you to add popups to your WordPress website. You may find a tutorial on Popup Toolkit WordPress plugin here . Are you already interested? And you want to try Popup Toolkit right now? Link Checker Toolkit v1.0 - A link checker software perfect for maintaining your reciprocal links - you get it free! or read more about the specifications of the Software + more Examples. I am a software engineer and the creator of Popup Toolkit v2.16 popup generator (new version of Popup Toolkit version 1.4). Some time ago an idea emerged in my mind. The idea of the perfect web-advertising tool. The most Powerful Means of advertising were the Regular Popups. And they still maybe have power, but they get blocked. There were also banners, flash movie advertisements and some simple form DHTML popups available. All these have their specific application and are very useful, BUT the Internet is such a large and quickly evolving market. Having only few advertising approaches seemed more than a drawback for the webmaster. My idea was born - to create a tool for making web advertisements using the Cutting edge web technologies. The Popup Toolkit idea was born. It took me time to research and develop approaches on how to use and implement the Modern Web Technologies, how to involve them in artistic commercial presentations. Having in mind the fact that Popups were the most effective way of presenting commercial information to the web user, I concentrated on developing a Popup Generator Tool (Popup Toolkit) that would generate popups with artistic behavior effects and looks. "-Why should I use Popup Toolkit popup generator instead of my current popup generator and popups? ", you ask yourself. Popup Toolkit generates many times more effective popups. Many times more customers, subscribers, visitors. This means many times more profit. "-How do the Popup Toolkit popups achieve this efficiency?" But let me present to you all the features Popup Toolkit encompasses in a systematic order. Popup Toolkit is a Windows desktop software application. 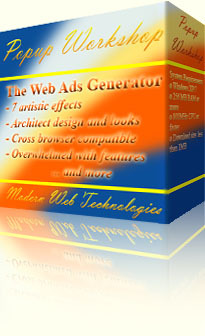 It is a Popup Generator also known as Hover Ads generator or Popup Ads generator software. Below you can read its features in a comprehensive list. Let me first show you screenshots of the rich scrollable and resizable user interface of the application. Note: Click on tabs in the screenshot to change tabs manually. Titlebar. You can set the titlebar background color and gradient (optional) The titlebar text, size, text style and text color. Or hide the titlebar entirely. Border. You can adjust the border style, color, thickness or hide the border. Shadow. You can set the shadow thickness, darkness or intensity (%), shadow color or switch the shadow off. (see transparent background popup example). Popup window elements. You may choose whether to switch on or off certain window element like scrollbars, buttons, etc. * Note: A very useful feature is the "Simple buttons" for the DHTML popups. Using external images for the close button and minimize button requires to load them from a URL. This makes the popup dependant on these image files. NOW Popup Toolkit offers to use simple buttons instead of button image files. You may set the color of the buttons and their shape. Size and position. You may choose the popup position given in pixels from any edge of the browser window or edge of the HTML document (the HTML document may be larger or smaller than the window). When the popup is positioned according to window, it will not move when the visitor scrolls the webpage. When the popup is positioned according to HTML document, it will move along with the webpage content when the visitor scrolls the webpage. You may choose the size of your popup in pixels or make it occupy full window width and/or full window height. Thus you can create, for example, full-width or full-height chromeless popups. Using the HTML Content Editor integrated inside Popup Toolkit. You can paste formatted text here from your favorite text editor, insert images, tables, links and more. Using the HTML Source Code Editor (click the <> icon in the HTML Content Editor's toolbar to switch to HTML Source Code Editor and vice versa). You can paste HTML Code here, for example from your favorite HTML editor. Select a Specific Web Page as Popup Content (select URL). Popup Toolkit supports UNICODE (utf-8) and you may enter content in ANY alphabet you like. For example you may use text in German, Cyrillic, Arabic, Chinese, Japanese, etc. Popup Toolkit supports xhtml, HTML 4.01 and HTML 5 documents. Also, all DOCTYPE declarations are supported as well as documents without a DOCTYPE declaration. Sliding Popups. These popups can slide in 8 directions. You can choose the direction where to slide in from, for example from top-left, and then, select a slide out direction, i.e. where the popup should slide out to, for example bottom-right. You may also set the slide-in and slide-out speeds. An arbitrary acceleration and deceleration of these two motions (smooth sliding) could be chosen. If you like your popup to act dizzy while sliding you may set a Dizziness from 0% to 100% both for slide-in and slide-out motions. Fade-in while slide-in and fade-out while slide-out is another sub-effect that could be selected. Bouncing effect is also available as sub-effect of sliding effect. After entering the screen you may set Slide-in Bouncing again from 0% to 100%. Rolling Popups. These popups use the Cutting edge web technology to make the popup window roll. You can set the roll direction and speed. Caterpillar Popups. Again, a very pleasant popup visual effect. You can set the direction and speed. Jumping Popups. The Jumping Popups are using a sophisticated calculations engine to simulate elasticity and earth acceleration (gravity). The engine is flexible allowing setting negative acceleration and thus emulating a balloon-like popup that will fly up instead of falling down. You may also make a jumping popup fall to the wall instead of to the floor. The user may set the acceleration (the speed the popup will fall with) and the elasticity - more elastic the popup the longer it will jump around without loosing its speed. Fading Popups. Make your popup fade in and fade out. Unfolding and Exploding Popups. The effect has settings for speed and how should the popup unfold and fold. You may set your popup to explode (unfold in all directions) or unfold in one direction only - vertically or horizontally. Same settings are available for folding. You may also set the popup to Spin while folding or exploding. DHTML popups will come OVER any flash movies or other special web page elements like drop boxes. DHTML popups may be set to follow the scrolling of the web page and thus stay visible when the page is scrolled (see Size and position above). DHTML popups may be set to be draggable with the mouse around the web page. When this feature is on you may drag the popup on its titlebar. DHTML popups may be resized with the mouse. When this feature is on you may resize the popup on its borders (the cursor will change when you mouse over the popup's border). Modal mask. You may switch on a Modal mask for your DHTML popup. The background around the popup will be darkened with a color you choose and a transparency level you choose. The visitor will be able to click only on the popup (and on other popups) but not on the webpage behind the popup until they close the Modal mask DHTML popup. Standard Popups. Except DHTML type of popups, the software generates Regular (Standard) Popups. You should be very familiar with these popups already, but let me say a word about them. They are blockable by popup blockers. They support a limited looks design capabilities compared to DHTML Popups and they support no behaviors (effects). Nevertheless, you may always need a regular popup - it opens in a new browser window and thus isn't "connected" with the web page opening it. It stays alive after closing the main web page. Popunders. This type of popups is similar to the Standard popups, but with one difference. The Popunder will hide itself behind the main borwser window right after it was opened. Popunders are not allowed on Chrome and Opera browsers and on these browsers they will act as Standard popups. Unblockable Popups. The Unblockable popup is NOT blocked by any popup blocker and can be opened On Exit. It is text only popup and can be used as an On Exit Unblockable Popup. It has two buttons at the bottom - "OK" and "Cancel". You can set onclick actions for both the "OK" and the "Cancel" buttons. If the Unblockable Popup is used On Exit then the "OK" button actions will NOT take effect. This is a browser security restriction. Here you can find a tutorial on using Unblockable Popup Software. There is a special Popup Type feature. You may set up your popup as a Regular popup type, but if it gets blocked a similar DHTML popup will open instead. This is very useful when you need the capabilities of the Standard popups but would like all visitors to see your popup even if they have a popup blocker installed. After you have got acquainted with the Popup Looks capabilities, Behavior Styles and Popup Types that Popup Toolkit supports, I will describe the Popup Triggering functionality, which is a crucial characteristic of each Popup window. The Popup may be Triggered on Opening the web page. So just after the web page loads the Popup will enter the screen. The Popup may be Triggered on Exiting or Closing the web page. When the user navigates away from the page or closes the browser window the Popup will show. The On Exit triggering is possible with all kinds of popups. Click here to see a test page for an On Exit Unblockable Popup. On Exit with Exceptions. This is a variation method of the previous one. The difference is that now you may specify certain links, which you DON'T want to open the Popup. Then you put a piece of code like onClick="DontShowWin_myid()" on such a link and then, when the user clicks on the link and navigates away, the popup will not show. The Popup will still show when navigating away using other links or when closing the web browser window. This triggering method has even more features. For further information and examples see the user's manual 'General Settings' tab -> 'Triggering Mode' (User's Manual). On Exit only through Specific Links. This is still another variation method of the On Exit method. Here you may specify certain links, that when clicked will Open the Popup. Again you put a piece of code like onClick="ShowWin_myid()" on such a link and when the user clicks on the link and navigates away the Popup will show. The Popup will NEVER show when navigating away using other links or when closing the web browser window. This triggering method has even more features. For further information and examples see the user's manual 'General Settings' tab -> 'Triggering Mode' (User's Manual). Delayed opening and closing. You may specify after how many seconds the popup should open. You may specify if the popup should Auto Close and after how many seconds it should Auto Close. You may set your popup to open in a loop. See a tutorial on this question here. Every time the user opens the page. Once only - the popup will never show again for this user. Once per session only - the popup will not show again until the user closes their browser window. Once per day - the popup will open once and not open again until a one day time has passed. Once per a period - the popup will open once and not open again until the given period has passed. You specify the period in days. Only on specific days of week - the popup will open only on the chosen days of week. The above features are realized using cookies on the users computer. If the user has switched his cookies OFF then these features won't work resulting in showing the popup every time. If you prefer not to obtrude the Popup on users with NO cookies enabled then you may setup your popup to NOT show on non-cookie browsers. Instant Mail-Send Buttons. Choosing this feature will include two buttons: "OK" and "Cancel". When the user clicks OK the whole content of the popup will be sent as a mail-sent form to the e-mail address you specify. Thus you can easily make your popup a form sent via e-mail to you for subscribing purposes for example. You may change the "OK" and "Cancel" buttons text to whatever text you like. Popup Code generation and usage. Popup Toolkit will automatically generate the popup code while you are editing features and settings. You may see the code in the 'Popup Code' tab, copy it from there using a click on a button, or automatically insert it into a chosen web page file (HTML document, PHP, ASP or Perl web page) found on your hard disk. Save and Load Popup Projects. You can Save and Load the Popup Projects you create. Thus you may save your Popups to edit later, or reuse them as templates. Future Development and Updates. You will receive all updates and future versions of the product for free. For examples, owners of Popup Toolkit will receive Popup Toolkit for FREE - WITHOUT ANY FURTHER PAYMENT! I constantly develop Popup Toolkit and also correct any problems and bugs that might appear. I am listening to my customers and I welcome their ideas for new features and effects. Compatibility. Popup Toolkit creates popups compatible with ALL BROWSERS (including their mobile versions)! Popup Toolkit needs Windows 10/8.1/8/7/XP/2000/2003 to run. Its minimal system requirements are 256MB of RAM, 800MHz CPU. If you need more comprehensive product overview and detailed specifications, see the online help/FAQ page here. If you have any questions, ask me via e-mail . I wish You success in your Web Business! Copyright © 2006-2019 Popup-Toolkit.com, All rights reserved.